When this card is Normal or Flip Summoned: You can Special Summon any number of “Skyblaster Tokens” (Fiend/DARK/Level 4/ATK 500/DEF 500), up to the number of monsters you control. Once per turn, during your Standby Phase: You can inflict 300 damage to your opponent for each “Skyblaster” monster you control. “Skyblaster” monsters you control cannot declare an attack during the turn you activate this effect. Throwback Thursday this week is a Token Generator that obviously saw more play in the Link Era, Phantom Skyblaster. Phantom Skyblaster is a Level 4 DARK Fiend with 1100 ATK and 800 DEF. Stats are weak on a Level 4, DARK is a great attribute and Fiend is a good type. When this card is Normal or Flip Summoned, you can Special Summon any number of Skyblaster Tokens (Fiend/DARK/Level 4/ATK 500/DEF 500) up to the number of monsters you control. Well hey, extra Link Material is always good. Would of been nice if they were Level 1, but you still got Link Monsters to use with the Tokens that aren’t Linkuriboh. The more monsters you control, the more Link Materials you’ll get as well in the form of Tokens. It is great we have Wee Witch’s Apprentice now to use the Tokens for. Skyblaster also allows you to burn your opponent for 300 damage for every Skyblaster monster you control but Skyblasters cannot attack that turn. Fun fact, this can burn if you control a Castel, the Skyblaster Musketeer. You probably won’t use this effect as it’ll probably be used as Link Material before your next Standby Phase, but it is a nice option to have. 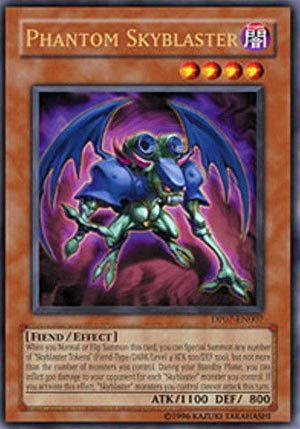 Phantom Skyblaster is a much better card than it was before, being just an option to summon Raviel, Lord of Phantasams, but now you got a ton of Link Monsters this can help you go into. If you are playing a Link Spam deck, Phantom Skyblaster can really help you spam Link Monsters. Art: 4.25/5 Terrifying little Fiend we have here. Phantom Skyblaster is a little Monster…little in terms of attack and defense, anyway (at 1100/800 respectively) but Dark and Fiend are fantastic, as well is being Level 4 in this instance. This little creature generates you Tokens (one per each Monster you have on the Field) which is great for Link players, obviously as this makes your Link Summons that much easier to accomplish without having to give up your Monsters when you can just use the Tokens instead. The turn you decide generate the Tokens, your Skyblaster Monsters can’t attack, but for a bonus, you can (optional here) burn your opponent for 300x Damage for each Skyblaster Monster you control. 1500 Damage, assuming you have 5, isn’t a terrible amount of Burn, so it’s a nice little secondary effect. Said effect IS once per turn, but able to be used more than once, if you can, so the optional chipping away is fun too. He can be useful big time in the theme, and anywhere else you plan an excessive amount of Link Monsters. If he works for you, by all means, use him. Solid card no doubt. Phantom Skyblaster has a great look, name, and effect. It’s a Level 4 Dark Fiend-type monster with 100 Atk and 800 Def. The stats are bad for a Level 4, but this monster shouldn’t be attacking anyway. Instead, Normal or Flip Summon it once per turn to Special Summon Skyblaster Tokens up to the number of monsters you control. So you’re getting at least one which is good enough for a Link Summon. Then if nothing happens during the whole turn, you can inflict 300 Direct Damage per Skyblaster monster on the field during the next Standby Phase. Phantom Skyblaster might not win ay contests of strength or of Direct Damage, but it can certainly extend Link Plays which is all it needs to do this format. Throwback Thursday indeed.